3) and the strong nuclear force G (from its mediating particle the Gluon). It’s a little inconvenient the particle of gravity, the Graviton, is beginning with a ”G” too. The next scheme gives the Standard Model particles and their couplings. The force mediating particles are drawn in circles; it are spin 1 bosons, except for the Higgs boson having spin 0. The fundamental particles are all spin half fermions, shown in rectangles. Of all possible coupling 9 do exist, 12 don’t. So the best part of the possible interactions does not exist. By example, electrons don’t couple. Without photons they don’t see each other. Photons don’t couple with each other too. Their wavefunctions just superpose. So there are not too many interactions between the fundamental particles. The storyline ELECTRIC NET FORCE IN REAL MATTER (first two gray buttons) shows that P is a long-range force that becomes short-range when originating from a neat mixture of even amounts of positive and negative electric charges. As discussed in the storyline NET FORCE IN QED (third button) the particles of the vacuum are not such a mixture. The electric charges of two different superposing Feynman diagrams do not see each other. It turns out the electric net force in the vacuum is zero. The weak nuclear force - the weak force - is a force that can change taste. It can change the generation, or family, to which the particle belongs. In that quality it reacts with all known particles including itself, but except for the other two force-mediating particles, the photon and the gluon. 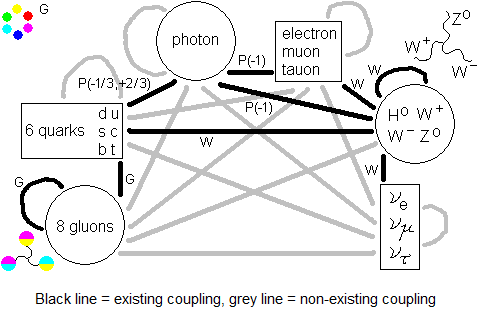 That is, the electric charges of the W+ and W- couple to the photon, but the photon and the gluon have zero taste. It is unknown whether this gives rise to a force in the meaning of an acceleration (change of velocity properties). As long as we have no reason to assume so, we suppose there isn’t. And so there is no net force either. W is short-range because of the large mass of the W-particles. I sort the Higgs particle H0 amongst the weak force particles. But maybe I should do it the other way around: to sort the weak particles amongst the Higgs particles. That leaves only one candidate for a net force in the vacuum: the strong nuclear force. The strong coupling constant is about 1. Higher order Feynman diagrams (more particles involved) do contribute significantly to the superposition. As a matter of fact all possible diagrams contribute with nearly equal strength. A well-mixed cloud of colors might yield a local force as real electric charges do in the storyline ELECTRIC NET FORCE IN REAL MATTER. Local force (a concept introduced there) was meant to build space from local patches that are attracting only their direct neighbor patches in space (and not the patches further away), in doing so making a short-range force to become like the gravitational force. I tried to investigate this in the last paragraph of the next page of this storyline, the last page of the storyline NET FORCE IN QCD. That paragraph is the first and last step in that direction so far - it isn’t finished, I should work on it further. The original idea was that gluons and quark pairs would appear and disappear in empty space, their lifetime bound by the uncertainty relations of Heisenberg. In the short while of their existence the patch of space the pairs embody contracts a tiny little bit. The patch only attracts its direct neighbors and drags them along with its contraction. And because all of space is made of likewise contracting patches, all of space would contract. In the storyline NEWTON EINSTEIN KIEKENS GRAVITATION, in brief NEKG, gravitation is assumed to be a streaming of a liquid Bose condensate of vacuum marbles, excluding other forms to contribute. Therefore my search for a net force comprising gravitation has come to a halt. So, is the quest for any net force in the vacuum quite over? Can we regard a particle antiparticle pair appearing and disappearing in vacuum in the absence of matter and energy, so that there is no gravitation? I mean, in just empty space? According to QQD arguments in paragraph Dark multiplication rules at page 2 of THE EXPANSION OF THE UNIVERSE, empty space is 1 OR -1. It has forward time direction from gravitation, OR backward time direction from backward time evolving gravitation. There are no points of zero elapse of time. So strange enough, it is not possible in our universe to have precisely zero gravitational field. The strength of the gravitational field may approach infinitely close to zero. But there is a time border and at one side of it gravitation dominates and the other side is dominated by backward time evolving gravitation. While the time border itself is a mathematical plane, not embodied by particles of zero elapse of time. So there is no area of zero gravitational field. A notion of particle-antiparticle pair creation is met at page 5 of NEKG as fully disconnected vacuum marbles superposed to the vacuum marble grid. 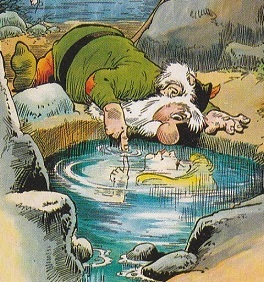 When the pair is not fully disconnected, it is part of the “fluid vacuum state” embodying gravitation. When the pair is fully disconnected, it only is a superposition to the vacuum, without any interaction between the created pair and the vacuum. They as to speak form a tiny vacuum on its own, a very little universe on its own. According to page 2 of EXPANSION OF THE UNIVERSE the particle of the created pair absorbs mass from the Higgs field while the antiparticle emits to the Higgs field. The Higgs field emissions and absorptions cancel each other, resulting in no net mass absorption, no vacuum marble absorption and no gravitation. According to (6.1) in paragraph The calculation of the time border, page 2, EXPANSION OF THE UNIVERSE, when a pair of particles emerges, the time border between the two particles is the mathematical equidistant flat plane between the two particles. The tiny universe, left to its own, does not contract nor expand. In gravitational field of sufficient strength the time border folds around the antiparticle to a small bubble. The act of folding is an interaction of the vacuum grid with the pair, isn't it? I mean, we go for the opinion that at each point of the grid time is going forward OR backward and not both. Local elapse of time is not a superposition of forward time gravitational field and backward time evolving gravitational field, resulting in different rates of elapse of time at different locations. Suppose - just suppose - the vacuum is a superposition of forward Higgs field of value 1 (strong field, with a lot of vacuum marble rearrangement) and backward time evolving Higgs field of value -1 (weak field of little vacuum marble rearrangement) from the backward time evolving galaxies far away, according to QUATERNION GRAVITATION page 2 and (4.9) at QQD page 4. Then most of the time there will be vacuum marble absorptions from the +1 Higgs field and only sometimes from the -1 field. 1) When an electron happens to absorb a -1 vacuum marble from the backward lepton Higgs field, it turns into a positron. Then it has to wait about the same (relatively long) time before it turns back to an electron by absorbing another -1 vacuum marble. 2) When the 3 quarks of a proton simultaneously absorb a -1 vacuum marble from the hadron Higgs field, the proton turns into an antiproton that has to wait about the same time before turning back into a proton, by absorbing another 3 vacuum marbles of value -1. These temporary violations of lepton and baryon number are not observed. So there are no backward contributions superposed to the forward time evolving fields. Unless the backward field is too weak to yield measurable amounts of violations. The antimatter galaxies that produce the backward time contributions, might be just too far away. 3) QED seems to do very well without backward time contributions. Unless the “illegal”, “immoral” behavior can be intpreted as backward time contributions - but no, the higher-than-lightspeed contributions then still aren't explained. Well, for convenience we assume there are no backward time evolving contributions to the forward fields. We assume particle statistics would have revealed the violations. Our vacuum here is forward time evolving only and their vacuum stricktly goes backward in time. And between them is the time border. So oké, the act of folding of the time border around the antiparticle is an interaction of the vacuum grid with the emerging pair. Outside its time border the antiparticle just reacts as a forward time evolving particle with an electric charge of opposite sign. The time border of the antiparticle absorbs from outside Higgs field. Then an emerging pair does contract a tiny little bit before disappearing again and in doing so it does have its influence on real particles “in” it. It embodies an extra gravitational force. And this is a little inconvenient since the storyline NEKG sufficiently explains the Newton gravitational law (the special relativistic effects on the field of rearranging vacuum marbles is supposed to yield part of general relativity - to work out yet). We don't need this extra force. A way out might be the following. We assume the vacuum in ground state - all possible superposing Higgs fields - to stretch out all over space. There are no parts-of-space, smaller or larger patches of vacuum marbles, to contribute. Each smaller patch of any velocity is automatically part of the private Higgs field of precisely that velocity. When matter is present, Higgs absorption or emission disrupts, tears the vacuum. Subsequent rearranging of vacuum marbles restores the flat grid. During the process of restoring the vacuum is “fluid”. When tearing is fast enough, in strong gravitational fields, then sole fully teared-of patches can come to existence, superposing to the gravitational field. I guess, for one vacuum marble of the hadron Higgs field (the dominant field) to be teared of completely, at least the 6 spatial neighbors (at the front and behind, left and right, up and down) and the 2 neighbors in time, (in forward and backward time direction), 8 neighbors in all, have to be teared of completely. And this is to be done before vacuum marble rearrangement can restore bonds. In weak gravitational fields this will not happen. As to speak, gravitational temperature is not high enough to let vacuum marbles “boil from” the liquid vacuum state. Which means that in weak gravitational fields, fields of low “temperature”, the process of particles popping in and out of existence within the borders of the Heisenberg relation, does not exists, virtually. But in strong fields they add to the field, embodying an extra gravitational force. No, the quest is not over yet. These are the accepted typical reaction times for W, P and G. When the gravitational field would have to drag particles along under P, then when a heavy exotic hadron decays under G in 3 steps, the gravitational field would still be fully occupied with the dragging-along of step 1, while step 2 and 3 already have been accomplished long ago, relatively speaking. This rules out W and P as being too slow; at best they have a small contribution. So for neat dragging, with its lightspeed, zero mass and 10^-23 sec reaction time, G has preference to sustain the Higgs field and the gravitational field for baryons. But as argued at page 4 of NET FORCE IN QED, there is a second Higgs field, weaker and slower reacting, for leptons. The Higgs particle has mass, it can be composed of well-known particles. If the Higgs field for hadrons consists of gluons and the Higgs field for leptons exists of photons in a Bose condensate, then gravitation of matter consisting of baryons and leptons, must be depicted by a kind of G-P then; G from “gluon” and P from “photon”. And what for the neutrinos? What is W? Since we have two Higgs fields now, one for hadrons and one for leptons, one can combine them to a “new” Higgs field. Is W+ W- Z0 in fact a new Higgs particle, made of a gluon “orbited” by a photon within their time borders? Or, if the gluon is made of a quark and an antiquark massless coinciding, a quark orbited by a photon? Or, since the photon then is assumed to be an electron positron pair massless coinciding, a quark antiquark pair orbited by an electron positron pair? And then the electron tends to orbit the quark while the positron tends to orbit the antiquark. All particles do so within their time borders in order to allow Higgs field absorption and emission to cancel as much as possible. This would be Z0. But why then Z0 has mass? And when the electron or positron is missing you would get W+ and W-. Hadron Higgs field absorption rate is about 1000 times faster than that of leptons, so they don't cancel completely, hence the W+ and W- mass. But how to get spin 0 then? Orbital momentum only is in amounts of 1, while we have a spin 1/2 or -1/2 to cancel. The spin 1/2 neutrino? on Elementary Particles I red.